The war across Westeros for one true king has degenerated into violent and underhanded skirmishes. George R. R. Martin’s lush fantasy scape with its opulent cities and diverse denizens has transformed into an ashy post-apocalyptic wasteland. 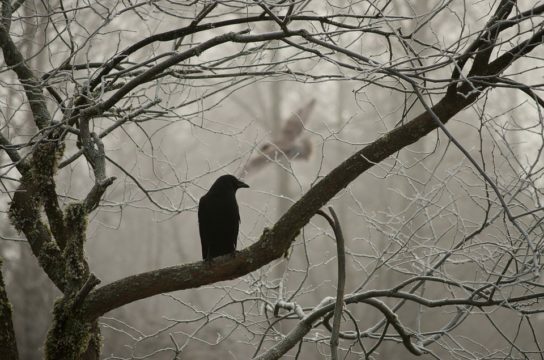 Martin is famous for showing no preference to main characters, and A Feast for Crows begins (and ends) no differently. We have further deaths, compounding those that went before in A Storm of Swords, and there aren’t many left to claim the kingdom. But the sudden removal of would-be tyrants and benevolent rulers alike hasn’t changed what has already gone before; the fight between the lions and the wolves, and all the other faction clans and Stannis supporters, has left much of the countryside scorched, corpses twined from the trees, towns in league with underground rebels, and new malevolent forces arising. It’s dark and suspicious days. As the narratives unravels, leaving out Tyrion after the first portion of the tale and barely mentioning Daenarys, John, Stannis, and Bram, the remaining cast of characters continue their scheming, all the while separating from one another and the new reality of their land. Meanwhile, we presume that nothing back at the wall with the walkers has changed. All these temporary power plays and kingdom building ploys, so elemental and visceral in the now, will soon prove pointless, if not laughable in the face of what is already looming. Irony is the poignancy of impetuous human nature, of empire building, king seeking, and even revenge. 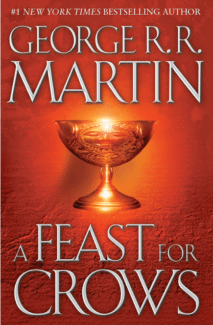 A Feast for Crows is both slower and faster paced than the book which proceeded it. It’s faster paced, partly, because the character focus is limited and so the characters who do have starring roles move more quickly and seem more relevant and “in the now.” It’s slower in that Martin introduces a whole slew of new characters and arising situations. Cersei, finally running an empire from the shadow of her remaining son, is dangerously close to gaining her desire for complete power. With victory in reach, nothing can stop her now and what was considered cruelty before is mere child’s play compared to what she will do now. Unfortunately for her schemes, post-Brienne Jamie can now see his twin’s transgressions and the brutality fueled foolishness of her chosen path. As Cersei gets further into empire building, the twin’s relationship erodes and finally shatters. This will be especially relevant in the conclusion when an over-stepping Cersei executes her final plan to rid herself of Margaery Tyrell and, therefore, any other claimants to the throne of Westeros. What can unholy love really overcome and just how long will it last? While Cersei and Jami, intriguing in their evil and yet well-drawn in their realistic changes and evolutions, dominate the book, a few lesser characters get their starring moments. Ayra, still driven by her quest for revenge, has supposedly found her place with the House of Black and White, an elite order of assassins. They have changed her name, her occupation, her essence, but the essential anger that defines Ayra has not lessened. With her many new names, however, it’s hard to keep up with the savvy street urchin and, admittedly, her cry for revenge has already stretched over three five hundred page plus books – let it go or execute it already. Her story and character, while well drawn, has been running in place for too long. Perhaps this is the beginning of the real change for her, but if so, it needs to accelerate, lest we lose all interest and the desire for revenge. Samwell (never a favorite of mine as – indeed – none of the wall story has truly captivated me) is set on a mission to bring Gilly, her newborn, and the old Master to safety in Braavos. Safety, of course, is a relative term and not one with a lot of meaning in any universe under the guileful pen of Martin. 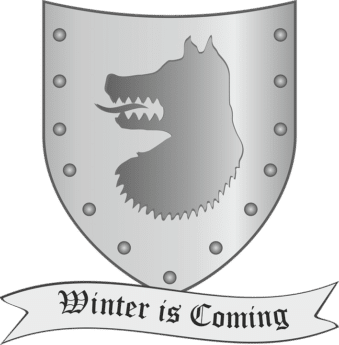 Sam, who has long been forced to confront and overcome his cowardice, now has his own vows to contend with, a shocking revelation about his friend Jon Snow, and a confession that he never wanted (and doesn’t know what to do with) from his old master. Arriving at the shores of Braavos, he discovers that he has been expected and a new plot waits for him. What it will mean for Jon – and for everyone else – remains to be seen. Back on the Iron Islands, which unfortunately are taking ever more page space, a new king is needed. Asha attempts to convince the old-school islanders that a woman king is best, but she is soon overruled by the wicked Euron. Cue music for some sort of upcoming involvement with Euron leading the Iron Islands even further into the battle for Westeros. The good thing – at least Theon isn’t mentioned, still apparently being held and tortured somewhere, hopefully never to grace any further pages. The Sand Snakes, a plot starting in the far off Dorne, which doesn’t seem even remotely related to what has gone before other than in Myrcella’s semi-involvement, takes up a vast amount of page space, seemingly a new story in its entirety. While the Sand Snakes and Arianne, the king’s scheming daughter, are interesting, their relevance to everything else that was already on full boil isn’t obvious. It’s essentially a new set of antagonists entering a story that is seemingly well beyond its half way mark. An old, beloved, and murdered character comes back for a startling role here and, while this in and of itself is sort of a new story (or, a very dark continuation of an old story) we are more than happy for semi-new plot. It’s revenge as living death and something else besides, some perverted form of justice. Brienne, ever trying to fulfill her vows, is still searching for Sansa, and in the midst of her good intentions, she is the first to confront this new specter and story. Meanwhile, Sansa, now also befuddled with many new names, is living with Littlefinger who has proven just how Machiavellian he can be. With Lady Lisa conveniently, and violently, out of the way Sansa wars between fear and gratefulness. Littlefinger is obviously far from done with her. Now, posing as his daughter, she’s on the inside of his plans. Overall, A Feast for Crows was enjoyable, if not my favorite in the series. The focus on Cersei is especially well represented as the scheming queen gets her moment in the spotlight and the chapters from her prospective are both titillating and suitably dramatic/horrifying. The other background travails of some favorites (Brienne and Littlefinger) and some forgettables (anyone from the Iron Islands) are well executed and not quite as slow as usual. Regardless of whether we like the character or the story, Martin’s usual quality writing is strongly in evidence. The traps laid have started to spring, events started to culminate, and the barren depression of a landscape festooned with corpses shows that there are now only two real choices: death or life. These choices, it seems, must soon be made. Indeed, we soon tire of the slog across Westeros, the decimated countryside and suspicious town’s folk, the entire Day After Tomorrow vibe. Something needs to happen before we, ourselves, conform to the slow relentlessness of decay. The advancement of side characters and introduction of brand new intrigues, then, isn’t exactly welcomed. While Martin makes everything he writes about interesting and intense, by book four we want to focus on those already introduced, those serpentine stories already so carefully set-up, those falls and fights that have been inevitable, and promised, for so long. We want the ashes cleaned and a new world established or the old world so far destroyed that nothing remains. We are ready to say goodbye to limbo and join the final battle, whatever that looks like.